Chester Alan Arthur was considered to be a very fashionable man for his time and was known for his trendy wardrobe. Upon taking the oath of office, Arthur did not immediately move into the White house. He insisted that the White House be redecorated and had numerous wagonloads of furniture, some containing pieces that dated back to John Adams, taken away and sold at auction. Former President Rutherford B. Hayes bought two wagonloads and the pieces he purchased can still be found in Hayes’ home in Spiegel Grove, Ohio. Arthur then hired Louis Comfort Tiffany, best known for his stained glass and one of the premier designers of the time, to redecorate the White House. There is no record of President Chester Alan Arthur sending White House Christmas cards, but considering his trendy taste in furniture and his need to stay up-to-date in all of his fashions, his Christmas cards would have been of impeccable taste. President Arthur’s beloved wife, Ellen “Nell” Lewis Herndon died of pneumonia on January 12, 1880 at the early age of 42 just after the family celebrated Christmas. This was only 20 months prior to Chester Arthur taking the oath of office. Upon her death, Arthur stated he would never remarry. After assuming the Presidency after Garfield’s assassination he asked his sister, Mary, to assume some of the social duties of the First Lady and assist with the care of his daughter, Ellen Hansbrough Herndon. President and Mrs. Arthur had two other children, William Lewis Herndon Arthur who died of a brain disease and Chester Alan Arthur II who was attended Princeton while President Arthur was in office. President Arthur had a stained glass window installed in St. John’s Episcopal Church as a memorial to his wife “Nell” having the church light lit at night so it could be viewed and admired from his office each evening. Certainly President Arthur was viewing this window as the church bells rang on each of the Christmas’s he spent residing in the White House. The stained glass window is still present in the church today. 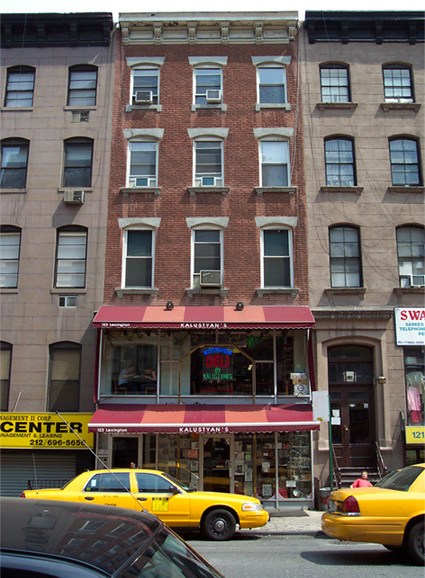 Chester A. Arthur's New York City apartment, where he celebrated many Christmas holidays before his stint as president (and only one after). 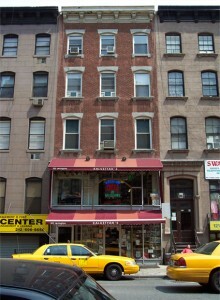 It is located in the present-day Gramercy neighborhood on Lexington Avenue in the east 20s. By Christmas of 1882, President Arthur looked emaciated and appeared to have aged well beyond his years. The President started taking walks in the late evening to relieve his stress and was rarely asleep before 2 am each morning. Shortly after the Christmas season, President Arthur began to have attacks from heart disease but the public was told he was just suffering from a cold. That April, President Arthur took a vacation to Florida for some much needed rest. During the vacation the president was experiencing terrible pain and the trip was cut short. The media was reporting that President Arthur was very ill but the White House insisted the President was due to exposure and seasickness. Later that year it was revealed to the press that President Arthur had been diagnosed with Bright’s disease indicating why the president didn’t aggressively seek the republican nomination for President in 1884. The president later confided in a colleague that his disease was in an advanced stage and was only expected to live a few more months. President Arthur’s last Presidential Christmas was celebrated in the White House. President Arthur enjoyed a Christmas drink with Senator Wade Hampton of South Carolina before calling for the family sleigh so he could accompany his son on a long drive. The president and his family enjoyed a Christmas dinner at the home of the Secretary of State. President Arthur received many gifts including a hammered silver button hook and boxes of premium cigars. Each of the White House servants was given a shiny five-dollar gold piece from the President. Just a few days after the first family’s Christmas celebration, President Arthur’s daughter, Ellen “Nellie” served as a waitress at a Christmas dinner for poor children and encouraged her father’s support of the charity. President Arthur’s early career does not indicate he had any political aspirations. Chester Alan “Chet” Arthur was the son of an Irish Born preacher and Malvina Stone, a Vermont native. President Arthur’s great-grandfather fought in the American Revolution and his mother was part Native-American. There was some argument that Arthur was born outside of the United States making him ineligible for the Presidency. Neither of the claims brought forth could be proven and eventually the rumors subsided. Chester Arthur studied that classics at college and earned his master’s degree in 1851 at which point he became an educator. Arthur then studied law and was admitted to the bar in 1854 and he began practicing law in New York City. President Arthur took a break from practicing law to serve as quartermaster general during the American Civil War. He was later the Inspector General and gained rank as brigadier general serving in the war until 1862. Arthur returned to his law practice after the war and was later as Collector of the Port of New York by president Ulysses S. Grant. In 1878, President Rutherford B. Hayes had Chester Arthur removed from this position. President Hayes had hopes of reforming customs collections. 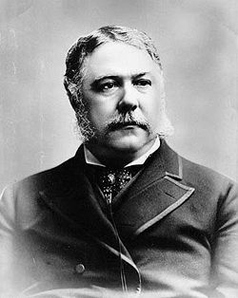 Rutherford B. Hayes could never imagine that Chester Arthur would later become president. In addition to Chester Arthur having poor relations with former President Rutherford B. Hayes, his predecessor James Garfield was not fond of the person who would ultimately become his vice-president and successor. Considering the poor relations between the two, it is doubtful that any White House Christmas cards were sent between the two presidents during the holiday season. President Chester Arthur was quite popular by the end of his presidency. He was considered very elegant with a physical appearance becoming of a president. He even received several marriage proposals from women who didn’t know he had sworn never to marry again. President Arthur returned his law office after completing his term and only made a few public appearances prior to his death in 1896 just on November 17, 1886 from a cerebral hemorrhage just before the start of the Christmas season. The day prior to his death he had requested all his papers, personal and official, be burned. President Chester Alan Arthur’s post-presidency was the second shortest to date. Chester…. Can i call you Chester? I feel like the world needs more Chester’s don’t you agree? Here you are such a great man with the sideburns of a bronco bull and yet your name has fallen off of the peak of popularity. I feel as though this is an injustice to the human kind. Our history is built with great man with equally great side burns. Abraham Lincoln, Thomas Jefferson, Morgan Freeman.. the list goes on. I have performed upkeep on my sideburns for about 20 years now and they are still going strong. This delicate locks of heavenly hair have kept me balanced while also providing me with something to play with while i am deep in thought. When i originally found out my wife as pregnant i knew that i would start my child early with sideburns. Unfortunately it was a girl. However, this does not stop a bearded man such as i. My daughter now has sideburns the length of the great Edward the galloping thoroughbred horse. Family pictures have become a little tricky because someone is usually covered by hair from someone else s face but we eventually figure it out.